Figure 1. South Slough and Coastal Frontal streams: Aquatic Habitat Inventory stream survey names. Each of these streams contains multiple reaches. Of the 9 attributes measured all but one were evaluated to be poor or fair to poor. Stream pool area was the only stream attribute that was evaluated as good. Coastal Frontal streams seemed to be particularly lacking in large wood and had more streams with bank stability issues. Aquatic habitat in coastal streams is critical for supporting the juvenile and adult life stages of anadromous and resident fish in coastal streams. The historic loss or degradation of aquatic habitat in coastal streams is directly linked to the historic decline of coastal coho salmon populations. The Coos Watershed Association assessed the aquatic habitat attributes of 45 streams in the South Slough and Coastal Frontal watersheds in the summer of 2010 and 2011. 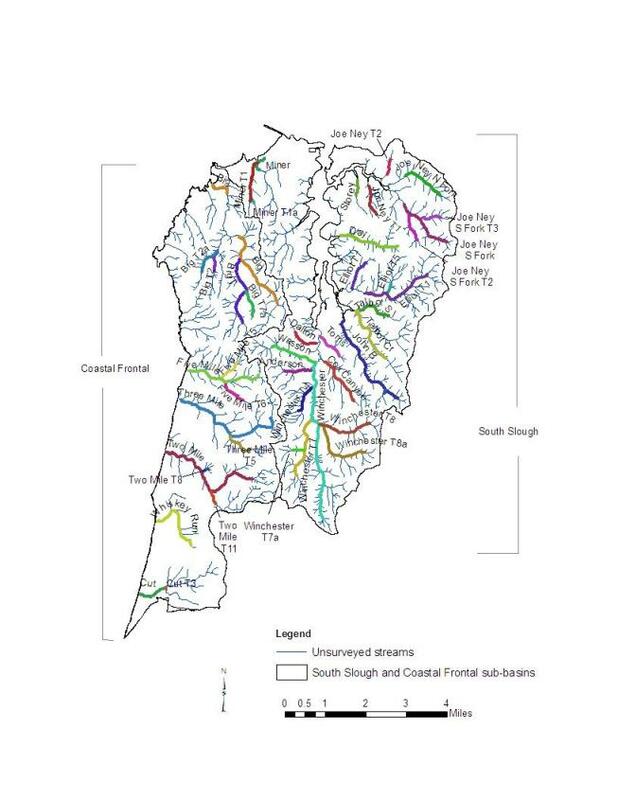 Surveyed stream reach locations are shown in Figure 1. Using Oregon Department of Fish and Wildlife (ODFW) Aquatic Habitat Inventory protocols (Moore, et al. 2006), field data were collected to quantify the following aquatic habitat attributes: 1) Pools; 2) Pool frequency; 3) Residual pool depth; 4) Large wood pieces; 5) Large wood volume; 6) Large wood key pieces; 7) Gravel in riffles; 8) Sand/silt/organics in riffles; 9) Bank stability; and 10) Riparian cover type. For attributes 1-9, data were compared with ODFW aquatic habitat benchmarks (Foster, et al., 2001) to help evaluate the ecological status of individual stream reaches. Data presented here are the mean of multiple stream reach values for each stream. Data from individual reaches are available for use in habitat restoration and enhancement project planning and design. Note that stream and reach lengths, are not equal across the survey. (i.e., some reaches are naturally longer than others). In the analyses below, the numbers of individual streams with certain conditions are compared as if they are equal in length, but the percent of surveyed stream length is based on actual, varying, reach length. Channel metrics and channel substrate information was also collected as part of the aquatic habitat survey. This information is available for project planning from the Coos Watershed Association. Figure 2. Pool abundance for project area streams as a percentage of all stream units. The red area of the chart indicates pool percentage at or lower than the ODFW benchmark; Green area of the chart indicates pool percentage at or higher than the ODFW benchmark. Error bars denote standard error of the means (95% confidence level). Pools provide important habitat for juvenile and adult fish, and benefits tend to increase with depth and frequency. Residual pool depth is the depth of a pool assumed to remain during low-flow periods. During the dry, warm summer months residual pools may be the last, and most crucial habitat remaining for fish. Pool frequency is the number of channel widths between pools, and indicates the availability of pool habitat within a stream reach. Higher numbers mean that pools are less frequent. Overall evaluation of the percentage of pool units in streams is good. See Figure 2. The minimum benchmark level for pools is 10%; it is very undesirable for steam habitat to contain less than 10% pool area. The majority of streams, 42 of 45, and 99% of surveyed stream lengths, meet or exceed the minimum benchmark level for pool area. The desired benchmark level for pool area is 35% or higher. Most streams, 35 of 45, and 91% of surveyed stream length, exceed the desirable benchmark level for pool area. Average pool area for these exceeding streams is 59%. These streams exceed the benchmark by 23 percentage points. Additionally, there are a couple things to consider when studying individual streams and restoration opportunities. 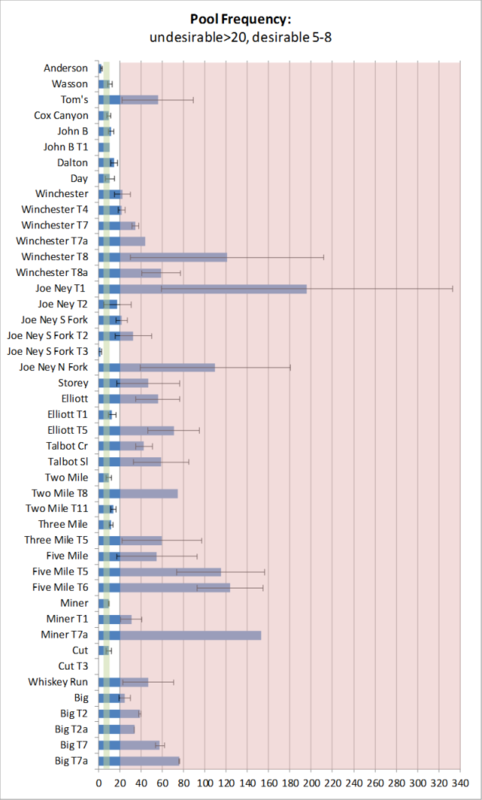 Standard error is more than the average value of pools in Whiskey Run, Joe Ney S Fork T2 and T3, Joe Ney T1, and Tom’s Creek. This indicates a very high variance in pool area between reaches in those streams. Some reaches in those streams may be deficient in pool area while other reaches exceed the benchmark. Additionally, note that main stem streams contain more pool area than their tributary streams. This difference may be attributed to tidal stream mouths, tide level at time of survey, and or flow restrictions, such as culverts, resulting in un-natural pool formation. Figure 3. Pool frequency for project area streams expressed as number of active channel widths between pools- the higher the number, the fewer pools there are in the stream. The red area of the chart indicates pool frequencies at or higher than the ODFW benchmark; The green area of the chart indicates pool frequency at or lower than the ODFW benchmark. Error bars denote standard error of the means (95% confidence level). Overall evaluation of pool frequency in streams is poor. See Figure 3. No streams meet ODFW’s benchmark range of 5-8 for desired pool frequency. Twenty-nine streams, and 65% of surveyed stream length, have very poor pool frequencies. Thirteen streams, and 32% of surveyed stream length, have pool frequencies better than the undesirable level, i.e. below 20. Two streams, 3% of surveyed stream length, have pool frequencies lower than the desired bench mark range. Ten streams have standard error of more than the average value for that stream; individual reaches should be examined. Figure 4. Residual pool depth for project area streams. The red area of the chart indicates pool depths at or lower than the ODFW benchmark; The green area of the chart indicates pool frequency at or higher than the ODFW benchmark. Error bars denote standard error of the means (95% confidence level). Overall evaluation of residual pool depth in streams is fair to poor. See Figure 4. Fourteen streams, and 28% of the small streams length, are below the undesirable benchmark level for residual pool depth. Twenty seven streams, and 62% of the small streams length, are within the range of benchmark levels for residual pool depth. Three streams, and 8% of length, exceed the desirable benchmark level. These exceeding streams exceed the desirable level by an average 0.44 meters. Anderson Creek is considered to be a medium width stream based on average reach active width. This stream, is within range of the benchmark levels, but does not meet the desirable level. One stream has standard deviation more than the average value for that stream; these stream reaches should be examined further. While stream temperatures may meet standards, a lack of pool depth in summer low flow months could be a limiting factor to coho summer habitat. Large wood in streams is important for many reasons. Large woody debris acts as cover for fish in streams, helps create pools through scour activity and enhances the quality of pool habitat for fish. As stream flow is diverted around woody debris gravel and other sediment is trapped creating new channels and spawning habitat. Decomposing wood in streams provides for the growth of microorganisms; a basis of the stream food web. Figure 5. Large wood (LWD) pieces for project area streams. The red area of the chart indicates LWD quantities at or lower than the ODFW benchmark; The green area of the chart indicates LWD quantities at or higher than the ODFW benchmark. Error bars denote standard error of the means (95% confidence level). Overall evaluation of large wood pieces in streams is fair to poor. See Figure 5. 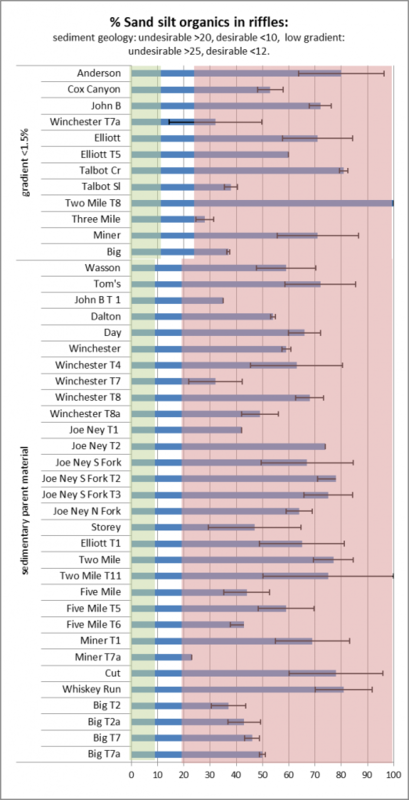 Twenty five streams, and 44% of surveyed stream length, have large wood pieces in amounts less than the undesirable benchmark of 10 pieces/100 m.
Twenty one streams, and 56% of surveyed stream length, have large wood pieces in amounts above the undesirable benchmark, but not meeting desirable levels. Seven streams, and 18% of surveyed stream length, have large wood pieces in amounts exceeding the desirable benchmark level of 20 pieces/100 m. These exceeding streams exceed the benchmark by an average of 10 pieces of wood/100 m.
Eight streams have standard deviation more than the average value for that stream; reaches in these streams should be examined further. Figure 6. Large wood (LWD) volume for project area streams. The red area of the chart indicates LWD volumes at or lower than the ODFW benchmark; The green area of the chart indicates LWD volumes at or higher than the ODFW benchmark. Error bars denote standard error of the means (95% confidence level). Overall evaluation of large wood volume in streams is poor. Results are shown in Figure 6. Thirty nine streams, and 85% of stream length, do not meet even the undesirable amount of wood volume; 20 m3/100 m. Six streams, and 15% of total stream length, contain wood volumes above the undesirable benchmark amount. One stream, with 3% of total stream length, contains wood volume exceeding the desirable amount of 30 m3/100 m. This stream exceeds the desirable amount of wood by an average of 2 m3/100 m.
Eleven streams have standard deviation of more than the average value for that stream; reaches should be examined for more detail. Note that more wood pieces and wood volume were detected in the upper South Slough sub-basin stream reaches and tributary streams. Forestry practices could be influencing the amount of wood pieces in upper stream reaches, and tidal flushing could be influencing the amount of wood pieces found in lower stream reaches. Figure 7. Large wood (LWD) key pieces for project area streams. The red area of the chart indicates LWD key pieces at or lower than the ODFW benchmark. Error bars denote standard error of the means (95% confidence level). Overall evaluation of large wood key pieces in streams is poor. Results are shown in Figure 7. Four streams, and 10% of stream length, have average amounts of key pieces above the undesirable amount of 1/100 m, but not meeting the desirable amount 3/100 m.
Forty-one streams, and 90% of stream length, have average amounts of key pieces below the undesirable amount. Fifteen streams, and 24% of stream length, have no surveyed key pieces of wood. Twenty streams have standard deviation more than the average value for the stream; reaches should be examined. Figure 8. Gravel abundance expressed as a percent of riffle habitat in project area streams. The red area of the chart indicates gravel at or lower than the ODFW benchmark. The green area of the chart indicates gravel at or higher than the ODFW benchmark. Error bars denote standard error of the means (95% confidence level). Salmon and other fish use gravel areas for spawning, and therefore it is important that riffles contain sufficient amounts of gravel for spawning. Overall evaluation of gravel in riffles is fair. Results are shown in Figure 8. Eleven streams, and 17% of surveyed stream length, have amounts of riffle gravel below the undesirable benchmark level of 15%. Eighteen streams, and 17% of surveyed stream length, have riffle gravel amounts above the undesirable level of 35% but below the desirable level of riffle gravel. Sixteen streams, and 46% of surveyed stream length, have riffle gravel amounts exceeding the desirable benchmark level. The average amount of riffle gravel in these streams exceeds the desirable level by 10%. Figure 9. Sand, silt and organic material abundance in riffle habitat in project area streams. The red area of the chart indicates sand, silt and organic material at or higher than the ODFW benchmark. The green area of the chart indicates sand, silt and organic material at or lower than the ODFW benchmark. Error bars denote standard error of the means (95% confidence level). The amount of sand, silt and organics in riffles indicate the amount of embeddedness of the stream bottom. Sediment is a natural component of streams, however, excessive fine sediments fill in the pore space between gravel restricting oxygen flow to fish eggs and macroinvertebrates. Overall evaluation of percent sand, silt and organics in riffles is poor. Results are shown in Figure 9. Two streams do not have riffles and are not included in the total stream length for riffle sediment calculations. Forty-three streams and 100% of the stream length containing riffle units have undesirable amounts of sand silt organics in riffles. No streams have standard error higher than the average value. It should be noted that lower reaches in or near tidal influence naturally contain higher amounts of sediment. Additionally, flow restrictions, such as culverts, may be skewing the average of riffle sediment. Figure 10. Percent bank stability in project area streams. The red area of the chart indicates bank stability at or higher than the ODFW benchmark (the greater the number the less stable the stream bank). Error bars denote standard error of the means (95% confidence level). Unstable banks contribute sediment to streams through slumping, general deterioration, landslides, and earth flows. Banks are considered stable if they do not show signs of active erosion at the time of the survey, and less than 10% unstable banks is the desirable benchmark amount. Overall evaluation of bank stability along streams is fair to poor. Results are shown in Figure 10. Only streams with some amount of unstable banks are shown in the chart. It is undesirable for streams to have over 10% unstable banks. The survey found that forty streams, and 89% of surveyed stream length, have less than 10% unstable banks. Five streams, and 11% of surveyed stream length, do not meet this level of bank stability and have excessively unstable banks. The streams with less than 10% unstable banks exceed this standard by 9 percentage points; on average, they are very stable. Six streams have standard error more than the average value for the stream; stream reaches should be examined further. Riparian areas provide a range of functions for steam habitat and water quality. They are the major source of large woody debris; riparian vegetation helps keep stream banks stable; and the provide important nutrients and habitat for macroinvertebrates and other wildlife. No specific benchmarks are used to evaluate riparian cover type, but a diversity of conifer and deciduous trees and shrubs is considered desirable. Overall evaluation of riparian cover type is poor to fair. Average amounts of riparian vegetation cover type classes per stream are shown in Figure 11. Overall, assessment streams average 10% conifer, 13% deciduous, 24% shrub, 49% grass, and 4% other cover type. All streams have a diversity of conifer, deciduous and shrub vegetation, except Cut T3, which has no conifers. Grass cover is the main vegetation type on 34 out of 45 streams, and is as high as 88% on John B T1. Twenty-four of 45 streams contain other (lawn/boulder/bare) cover type, and this cover type is as high as 40% on Big T7a. Shrub cover may include undesirable blackberries or other invasive species. Table 1. Benchmark summary of Aquatic Habitat Inventory stream reaches. The aquatic habitat survey benchmark analysis is summarized in Table 1. The summary indicates that survey streams generally have good amounts of pool units, and good bank stability. Conversely, large wood, especially volume and key pieces, are deficient and need attention in almost all survey streams. All streams containing riffle units have undesirable amounts of fine sediment (sand, silt and organics). This table can be used to identify potential action types and streams that need improvement. Additional analysis of specific reaches, available from the Coos Watershed Association, should be conducted to specify restoration action sites and best practices. Foster, S.C., C.H. Stein, and K.K. Jones. 2001. Oregon Department of Fish and Wildlife, A guide to interpreting stream survey reports. Edited by P.A. Bowers. Information Reports 2001-06., Portland. Moore, K., Jones, K., and Dambacher, J. May 2006. Oregon Department of Fish and Wildlife, Methods for Stream Habitat Surveys Aquatic Inventories Project, Conservation and Recovery Program, Version 15.1 Corvallis, OR.